Have you always dreamed of a destination wedding? Want to feel sand between your toes, sunshine on your face and hear the sound of waves crashing in the distance? Well, you can have this and more, without stepping a single toe out of the country - if you choose Lulworth Castle in Dorset as the location of your Happy Ever After. Is it a proper castle? Lulworth is a hand-on-heart castle near the world heritage Jurassic Coastline and comes complete with soaring stone towers, 12,000 acres of beautiful countryside and thoroughly majestic credentials (Kings used it to hold grand banquets in the 17th century). 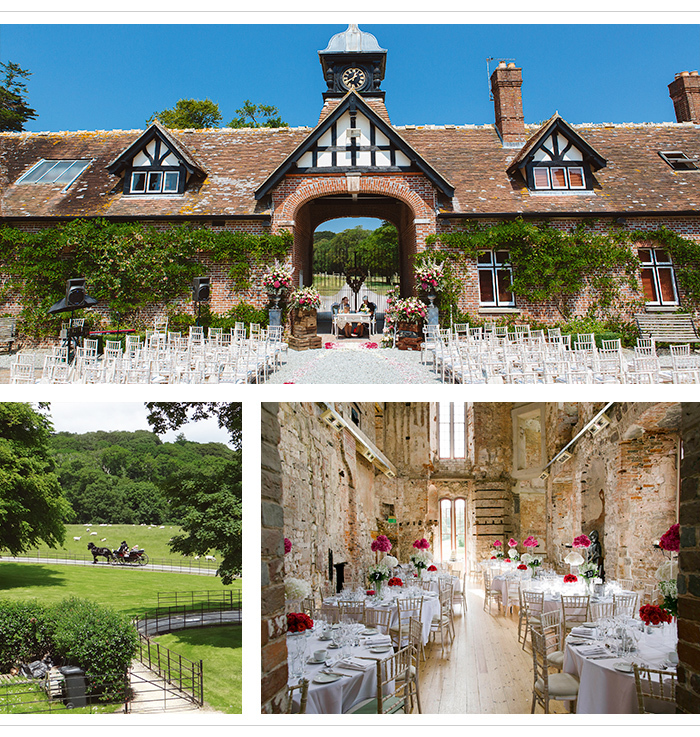 The Lulworth Estate offers two options, both perfect for summer weddings. The Castle itself boasts an open-plan interior and exposed chalk and stone walls, making it ideal for dressing the space as you wish. Exclusively yours for the entire day, the Castle can accommodate up to 120 for a sit down meal, expanding up to 200 for dancing in the evening. The Courtyard and rooms, set slightly apart from the Castle. The space comes with charms all of its own, including a versatile outdoor space surrounded by multi-purpose event rooms. The Courtyard can welcome 80 guests for an outdoor ceremony, with the option to construct a marquee for extra capacity. It would be a shame to travel all the way to this spectacular corner of Britain and fail to see any of it. The Lulworth Estate includes Durdle Door Holiday Cottages, a development of six luxury cottages perched on a hill overlooking lush countryside. Sleeping up to six, all cottages share exclusive use of the fitness and recreation barn and in the summer months, heated outdoor swimming pool. The lawns and surrounding parkland of the Castle and Castle Courtyard are more than spacious for your wedding guests to enjoy a glass of chilled champagne and indulge in a few pre-dinner nibbles while taking in the dramatic views of the Jurassic Coast. With years of wedding events both large and small under their belt, the team at The Lulworth Estate are experts in catering to your every need to ensure you, and your guests, have a summer wedding to remember. Want epic scenes of coastal beauty as the backdrop for your Big Day? This is the place for you. Lulworth forms part of the Dorset and East Devon World Heritage Site known as the Jurassic Coast. The 95 miles of coastline represent an astounding 185-million years of the Earth's history. UNESCO awarded the area World Heritage Site (WHS) status in December 2001 and the site was formally opened by the Prince of Wales at Lulworth Cove in October 2002. As England's first natural WHS, it offers universal value to all mankind.